Whoops. Did I just type "fun?" Did I type "wonderful?" Let's delete those adjectives and start over. I'm at that nerve-wracking stage with my latest book where the part I control (ie. the words on the page) is complete, and now my publisher is in control (ie. creating a cover.) Before I became a published writer, I dreamed of this stage. This magic, where your tenderly crafted story is transformed from a stack of double-spaced typed pages to a realio trulio book that strangers can find in a library or bookstore. Little did I realize, back when I was uninitiated and unpublished, that even if one has a fabulous editor (which I do) one cannot possibly prepare for the whims and fancies of the rest of the unseen horde working in that big publishing office in New York. It reminds me of sending a child off to elementary school: you think the teacher is the only adult she'll have to deal with. You never consider all the others who weigh in during your child's school days, like the mean lunch ladies, the grouchy bus driver, and the scary principal. Even with a great teacher in the classroom, those other folks influence a child's school days. Seriously. A few months ago I saw a draft cover design for my new book, Jersey Tomatoes Are the Best, which will launch in early 2011. I really liked it. It was clever and eye catching and age appropriate and definitely something a teen would pick up. That's the key here: would a kid pick this up? Because let's face it, teen readers DO judge books by their covers. So, I was happy. Surprisingly relieved. Because the road to the cover of my first book, Brett McCarthy: Work in Progress, was a tad bumpy. It seemed that this time, with Tomatoes, it was going to be smooth sailing. Then, a few days ago, the bad news arrived: the lunch ladies didn't like the cover. New designs were in the making. I had a strong, visceral reaction to this cover. The copy at the top clearly draws on the "definitions" idea, which is cool. But the rest looked like a target at a firing range, with purple soccer girls all in a vulnerable array. And with a fatality at the bottom. Here's the thing: no one gets shot in this book. It's a story about friendship. It's humorous. The cover clearly didn't match the "spirit" of the novel ... and we realized the problem was the title. 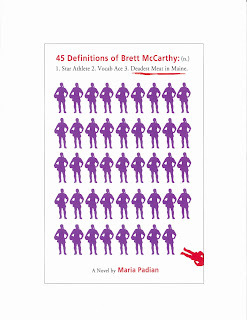 This is the image used for the paperback Advance Reader Copies the publisher mailed to promote Brett. I liked it. It captures the main character's personality, and I loved the visual play on the work-in-progress theme. I especially liked the paintbrush with my name above it. You see the basic idea, right? A dictionary. Merriam Webster's Collegiate, to be precise, and on the right are the wonderful little tabs you use to get right to the word you're looking up. The main character, Brett, is redefining herself throughout this story, so that's the theme they put right on the cover. Along with a truncated line drawing of a girl that used to be a soccer player. I'm not going to detail my emotional reactions throughout this process, except to say my poor agent took the brunt of it. She's also the one who eventually told me it was time to stop arguing with the publisher because I was, after all, a first-time midlist author who had limited influence over this stage. And as usual, she was right. I'm no J.K. Rowling, and in this economy I should probably be grateful that I even sold a book. I'll just say that when I visit schools today and ask the kids to raise their hands if they like to read books that remind them of dictionaries, nary a hand goes up. I like it. A lot. I don't think that's necessarily Brett on the cover, but it sure looks like one of her friends. And it most definitely captures the spirit of the main character and the book as a whole. So now, with this latest news from my publisher, I guess it's once more into the breach. Jersey Tomatoes Are the Best is about two teens from ... you guessed ... New Jersey. They are extraordinary: one is a state champion tennis player who gets recruited by a tennis academy in Florida; the other is a gifted ballerina who is chosen for a prestigious ballet school in New York. It's a story about the pressure gifted kids face as they learn to take ownership of their futures as well as deal with the expectations of the adults in their lives. It's also about friendship, and what we'll do ... or not do ... for the people we love. It's looking like the best year ever for lupines in my garden; don't ask me why. They are a persnickety plant for sure: resisting transplanting but then growing in wild abundance in the most unlikely, inhospitable soil. Who can predict a lupine's mood? Or why it prefers roadside, salt-soaked dirt, instead of the rich compost I bestow on it? I know you can find lupines in plenty of places outside of Maine ... I've seen riotous fields of lupines in Iceland, and gorgeous specimens in my cousin's garden in Ireland ... but ever since I read Barbara Cooney's Miss Rumphius to my children I think of them as a uniquely Maine flower. I know it's not fair to claim them, but, there you have it. I love this time in the garden. Blue and purple predominate; the colors are still cool. The fire and heat of red bee balm, golden coreopsis and yellow daylilies is for July, when summer is ripe. I love gardening as much as I love writing stories, and for me the process is similar. It's about completing the big picture one small step and one mundane task at a time. Head bent, hands dirty, back sore, you yank one weed then another and then another ... and when you come up for air, and step back it's ... lovely. That's how I craft a paragraph. Scratching, slow going, dead-heading and picking out the bad stuff, until I can step back, read it out loud and ... yes. It sings. This takes a long time. And I can't let myself think about that, because in spite of my chosen avocation and beloved hobby I'm a fairly impatient person. Writing and gardening is not for people in a hurry. There's a reason why a garden is filled with slugs and snails. Of course, in all fairness, there are also some pretty zippy creatures. Butterflies. Bees. And I've been spotting quite a few hummingbirds in this patch of Soloman's Seal. I thought they were drawn predominately to red, but the nectar in these bell-shaped buds must be pretty sweet. I'm far from alone in drawing this comparison between gardening and writing. I know it's "been done," and done better than me, but that's not stopping me these days. I wouldn't write a word or plant a single flower if I worried about who's doing it better. I'm at the stage where all I can do is yield to my own story and admire what others create, no worry allowed. If you're also looking to admire: a friend recently gave me The Wild Braid: A Poet Reflects on a Century in the Garden by Stanley Kunitz. It's absolutely lovely. "Almost anything you do in the garden, for example, weeding, is an effort to create some sort of order out of nature's tendency to run wild. ... The danger is that you can so tame your garden that it becomes a thing. It becomes landscaping. "In a poem, the danger is obvious; there is natural idiom and then there is domesticated language. ... Once the poem starts flowing, the poet must not try to dictate every syllable." I'm not sure how that translates to writing fiction, but I'm inspired to try. I recently joined a Facebook group called Children’s Authors and Illustrators, and they’ve started a discussion where folks can share their first-time publication stories. They run the gamut. From the self-published to “A miracle occurred and they found my manuscript in the slush pile” to “My agent did it all!” There seems to be no single road to the Land of Publication, although one consistent point emerged: to fuel this journey, you’ve gotta work hard. There is no getting around the work. Not simply the pages and pages of rewrites: we all know about revision. Not simply the emotional work of dealing with rejection and forging ahead anyway: we all know about the piles of rejection letters before the book finally sells. But the real work no one tells you about. Years … no, decades of apprenticeship where you write fairly horrible, unreadable stuff that you file in boxes in your basement. Years when you spend most of the day at a “paying” job, only to squeeze the writing time in the slim spaces between sleep and commuting. Months you spend on the first 150 pages of a novel that seems to just write itself … only to hear from your most trusted critique partner that the concept is completely undoable and would you abandon it now, please? But then, lightening strikes. You find your story. It’s not easy to write, but it feels good, so you go with it. Next thing you know, you’re typing “The End,” (which, by the way, is a tremendous, awesome rush) and photocopying it for readers, who tell you they love it, but …. So you fix the “buts” and send it to an agent (that’s the other thing that emerged from the Facebook discussion: nowadays you need an agent.) who loves it, but …. So you fix more “buts” and the agent sends your baby out into the wilds of first-round submissions to publishing houses and … kaboom. Someone likes it. Loves it, actually, and believes in it, and you, and is going to send you money and bind your baby with a cover and slap an ISBN number on it just to make the Library of Congress happy and Life is Good. And it seems, in that moment, that this just happened … but it didn’t. It took years, and lots and lots of hard work. So it was with particular joy that I attended a book signing this past Saturday at the Gulf of Maine Bookstore in Brunswick, Maine, to hear my friend, Paul Doiron, read from his debut novel The Poacher’s Son. Paul is the editor in chief of Down East magazine as well as a registered Maine Guide and outdoorsman, and has written a literary detective novel set in the North Woods. It was sold as a three-book deal, has received more starred reviews than I can recount here, was reviewed in the NYTimes book review and reportedly (although Paul won’t swear to this) had an initial print run of 100,000. Now that’s a lightening strike. Here are Paul and I at his signing at Gulf of Maine Bookstore. But here’s the fact of the matter: even if that book had nary a starred review, a meager print run and no advance, it’s a thrill. There’s nothing quite like seeing the UPS guy pull into your driveway with that carton from your publisher. Nothing quite like ripping it open and … there it is. Your story, all dressed up like a real book. And a signing, with an audience filled with friends, is such a gift. Gary Lawless, a poet and proprietor at Gulf of Maine, embodies the Independent Bookstore Owner Platonic Ideal. His well-stocked shelves are packed with great reads you’d never find at a chain store, and Gary and his partner, Beth, always seem to have all day to chat and share stories. This is Gary Lawless of Gulf of Maine Bookstore. I recently dipped a toe into the world of Skype Author visits … with mixed results. For those who are even less tech-savvy than I (and few are, I suspect): Skype is free software you can download onto your computer which enables you to video-teleconference using a webcam. It’s like turning your laptop into a two-way, interactive television. Anyway, here’s the scene: I had brilliantly scheduled a Skype meeting with an after-school book group in rural Maine for the 30-minutes before I needed to drive my daughter to her lacrosse practice. My son was supposed to be at a tennis match, and I had set up my laptop in our sunny, open-concept dining room instead of my dark, basement office. 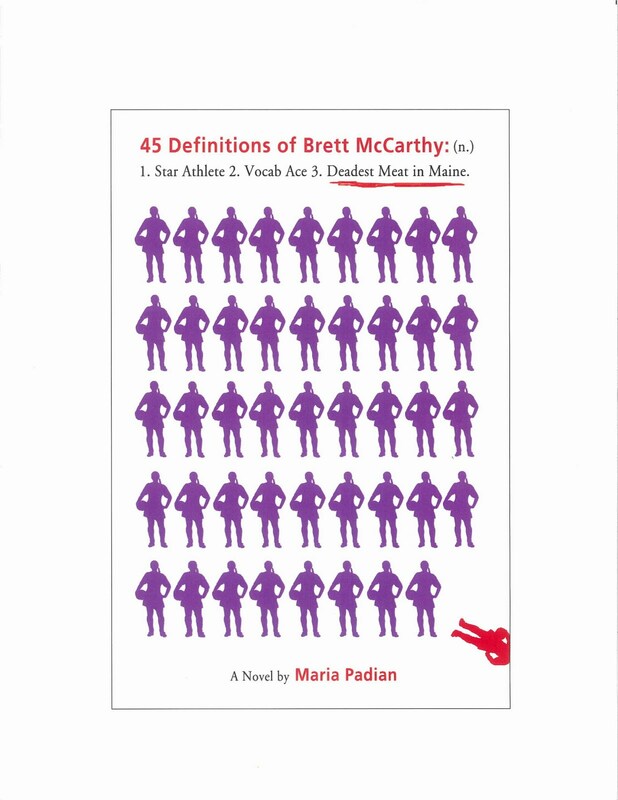 The house was quiet, the dog was outside, and I was chatting calmly into my webcam with a group of girls who had just read Brett McCarthy: Work in Progress. Then, the front door slammed open. Luckily, he didn’t. He strode into the dining room, weighed down by an enormous backpack, his tennis bag, plus the mail he’d just collected, and stared curiously at me while I spoke to my laptop. He’s a fairly intelligent lad, and figured out what I was doing … so instead of speaking, he waved. He started to use sign language/charades of sorts to indicate that he was indeed home (like I didn’t know that?) and that his tennis match was cancelled. He pulled up a chair alongside me, unfolded the newspaper, and started to read the sports section. Really? I’m thinking. This dude is really going to rattle the newspaper while I Skype? Off-camera, I made a chopping motion to him with one hand, then pointed to the other end of the house. As far as I was concerned, the meaning was clear: beat it. The dude shrugged. He got up. He sauntered into the kitchen, which is essentially an extension of the dining room. He swung open the fridge door and began rummaging. Yogurt, I’m thinking. Grapes. A glass of milk. Choose a silent snack. Please, no potato chips. As if he read my mind, he slammed the fridge shut. He turned and zeroed in on the new bag of Cape Cod 40-percent-lower-fat chips. My sister, Christine Bolzan, who is something of a social media expert in the Boston area and has coached me on Skyping, says it’s very important to keep your gaze focused on the green, pinpoint light of the webcam as you speak. Otherwise, the folks on the other end see you looking into your lap, or staring off into space. Concentrate on keeping your head still; smile pleasantly, she said. It occurred to me that I’d never asked her what the folks on the other end see if you pick up the laptop and hurl it across the room at your son. Was it Dave Letterman who pioneered MonkeyCam? I was on the verge of pioneering crazed-mother-skyping-author-cam. “Where do you get your ideas?” one student asked as The Dude, crunching, moved on to the utensils drawer. I hate my life I hate my life, I’m thinking, as I replied to the green light, “Well, my children have provided a lot of inspiration.” I tried not to watch, but The Dude had found a piece of blank paper and scribbled on it. He approached. He stood before me, waiting, holding his paper. Why won’t he go away why did I ever have these children, I’m thinking, as the teacher at the school 300 miles away motioned another student up to the camera for a new question. My son, sensing a break in the action, held up his paper. A note. “I’m going out to get something to eat. Be back soon,” it read. YOU CAN’T TAKE THE CAR I NEED TO DRIVE YOUR SISTER TO LACROSSE PRACTICE!!! I screamed. In my head. My still head. As I smiled pleasantly at the nice students on my laptop. As I put up my off-camera hand in a “Halt!” sign, eliciting a confused, disgruntled frown from The Dude. In the 20 seconds it took to reconnect I managed to communicate with my son not only my extreme irritation at his distracting me during a Skype author visit, but the imperative that he not take the car in his search for bigger and better snacks unless he also planned to drop his sister off at lax practice. Which he did. Semi-quietly. If the folks at the other end heard any commotion, they were too polite to comment. It is, actually. But … beware.